South Africa is not the only country facing high food prices. Many other countries in Africa, as well as in the rest of the world, are also experien-cing rising food prices. One of the reasons why food prices are rising is because there is a greater need for food worldwide. In developing countries, for example, people are earning more money to buy food. This leaves too little to go around for everyone. Climate change also contributes to the rise in food prices. Bad weather conditions like droughts and extreme heat, floods, and frost during the past months have caused food crops to fail. The rise in the oil price also plays a role. Rising oil prices cause the cost of fertilisers and food transport costs to go up. It means that the land on some farms that was used to plant food, is now used to produce fuel, and food that used to be eaten is changed into fuel. Government's Social Relief of Distress programme is helping people who are so poor that they cannot meet their families' most basic needs. To put this programme in place, government has given an amount of R124 million to the South African Social Security Agency (SASSA) and provincial departments of social development. You need help while you wait for child grants to be processed by government. You are affected by a disaster, like your house being flooded or burning down. You do not qualify for a social grant, but you are in a desperate situation due to things like unemployment. You are unable to get maintenance for your child or children from the child's other parent. You have been affected by a disaster, but the area or community in which you live has not been declared a disaster area. 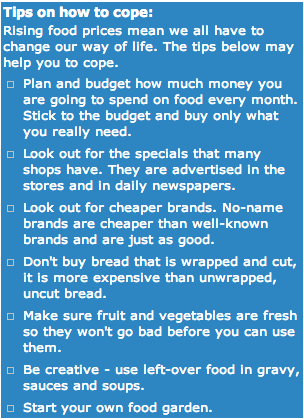 The help may come in the form of food parcels or vouchers to buy food. But some provinces may give cash. Social Relief of Distress is given for a short period of time only, usually for up to three months and sometimes for six months. To get help from this programme, you can apply at your nearest Social Security Office. You must have the 13-digit bar-coded ID and children's birth certificates. You must be able to prove that you have applied for a grant, had an emergency, tried to get maintenance, have no other support, your marital status, and that you have no income, or have a short-term medical disability. If you do not have an identity document and birth certificates, a sworn statement from your local police station, chief, councillor or religious leader may be enough proof. Once an application is submitted, the applicant's real need for the service will be considered, as well as the credibility of the application. Applicants will get their first month's food parcel, voucher or cash even if they do not have all the necessary documents. But all documents must be submitted to the officer before the second month's payment is due. If you do not submit all the documents, you may not get your second and third month's food parcel, voucher or cash. The relief programme is only given for three moths, but if there is no change in your situation after getting the grant for three months, you may apply to have the grant extended for a further three months. Tlphia Ntelebi from Philippi Park informal settlement in the Cape is the only breadwinner in their household. Her husband is ill and cannot work and she is the mother of two boys and a girl. 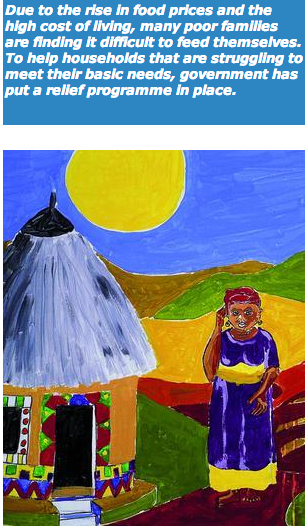 Ntelebi is a domestic worker for different people and is also completing her matric. With all these responsibilities and a family to feed, her life is not easy. But instead of letting this get her down, she is doing something to beat the high cost of living. To help save money on food, Ntelebi started a vegetable garden. "A bag of potatoes costs about R35 in the shops and by growing my own I save a lot of money," Ntelebi said. She said that potatoes grow quite quickly and can be used in many different ways. In summer they also plant mielies, watermelons and pumpkins. The produce from Ntelebi's garden doesn't only help her to feed her family, but also to earn some money. 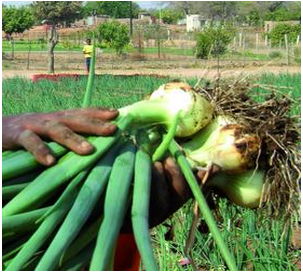 Any vegetables from the garden that are not used by the family are sold to people in the area at a low price. The Makeleni family lives in an informal settlement in Philippi in Cape Town. Noluthando, 26 and Nolukholo, 21, live with their brother and mother in a shack. All of them do their bit to help with the household expenses. Noluthando works at a factory in Salt River where she presses clothing during the week. During weekends she works as a salesperson at a clothing store in Kenilworth. mother works as a domestic worker and their brother is still in primary school. Noluthando said that all their contributions were not enough to cover their expenses. Like many other families, they are affected by the rising food prices. 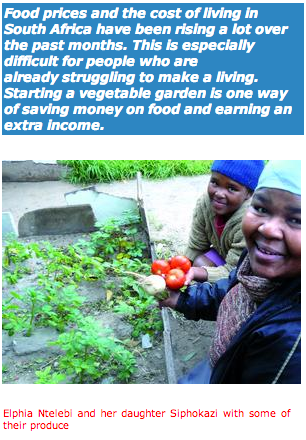 To help them survive, they started a vegetable garden. They grow chillies, beans, sorghum and herbs. The herbs are used instead of medicine. Sorghum is very tasty and adds flavour to dishes, Noluthando said. They also use it to thicken bean dishes. "Since we have started growing vegetables, we don't have to buy so much food anymore," she said. "With the money we save we are able to buy bread and meet other basic needs." The Makeleni family believes that with the ever-increasing cost of living, people have to be more creative to survive. That is why they have found ways to adapt instead of just giving up.